Knowledge, expertise and work ethic are what sets us apart. We really can say, the best. Jim does things only one way, that’s the right way. No corners cut, no quick in and out. Jim takes the time to do things the way they’re supposed to be done. Jim has the expertise and work ethic you want working for you. Jim, a State of Michigan Master Plumber since 1975, also has eight licenses and certifications. New construction, repairs and replacement, Jim has extensive knowledge and experience in all phases of plumbing, heating and cooling. 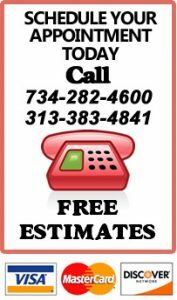 Call a trusted, reliable, and honest Downriver plumbing, heating and cooling company. Call Gill Plumbing & Heating for all your heating, cooling, and plumbing service, installation and maintenance needs. Completely trust worthy and professional. As a stay at home mom of 2 I felt completely comfortable with them in my home. The work was done efficiently and fast. I would recommend and use them again. I would give Gill Plumbing 10 stars if I could. I have been using Jim for years and years and would never use anyone else. Him and his staff always do an outstanding job. They clean up after themselves. Today, I had a new furnace and air conditioning unit installed and you can’t even tell anyone was in the house it was so clean when they left. Josh did such a great job! He explained things so clearly, did a great job and then cleaned everything up. I was compleltely satisified and wanted to let you know that I will always call Gill Plumbing and Heating. Thank you so much! Extremely reliable, knowledgeable and fairly priced. Very professional, quick and reasonably priced They are a well established family business that takes care of their customers. I have used Gill for years. I have never had a problem. I have had a furnace installed, air conditioning repaired, gas line repair and numerous plumbing jobs. There was only 1 occasion where a plumbing repair wasn’t fixed right the 1st time. The owner himself then came out. They are and will remain my number one pick for honesty & workmanship! I have known Jim for over 40 years and his work ethic is superb. He goes the extra mile to make sure his customers needs are met which often means working late into the day. His work quality is top notch and there isn’t any other company I would trust more. 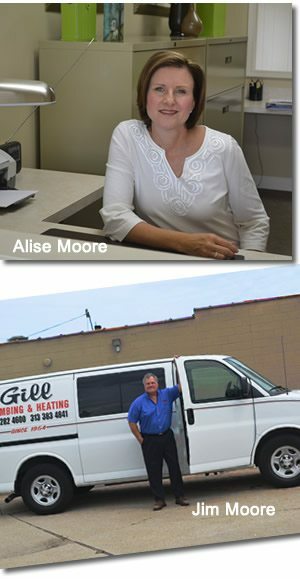 You can’t go wrong with calling Gill plumbing for all your needs! Gill Plumbing and Heating replaced our old furnace. The work was done quickly and cleanly. No problems since the installation. Customer service was friendly and helpful in helping us choose the right furnace for our style home. Highly recommended. © Gill Plumbing and Heating. All Rights Reserved.